Skin Monarch M REMOVAL kit includes:Microblading needle boxes: 5R, 7R, 21R (one box of each size).Autoclave holder for microblading needles (1 pcs. );Cosmetic bag (1 pcs. );Cleansing Foam (1 bottle. );Micro brush applicator (1 box. );Neutraliser (1 pcs. );M Removal (1pcs. );Master care (1pcs. );Cleansing Gel (10 pcs. 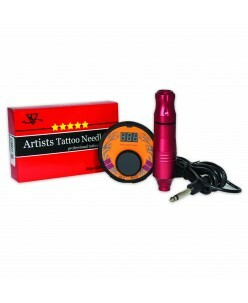 );Scarcare Gel (10 ..
Starter Kit for Tattoo Artist Tattoo machine; Power Supply Contact wire; Steel Tube; Grip; Holder; Needles: ..